Give your home or office character with our professionally installed dimming systems. From family homes to major commercial buildings, dimming systems provide you with freedom of control over your lighting. Dimmers allow you to create any mood in any size space and are an excellent upgrade to dens, offices, classrooms, restaurants, and many more applications. At Custom Electrical Solutions, we provide solutions for every need throughout Broward County, Miami-Dade County, and Palm Beach County. Out fully customized dimming systems begin with a FREE consultation so we can get to know you and your unique needs. Next, we will design and install the dimming system of your choice, giving you complete control of your interior environment. We provide dimming panels and controls for projects of all sizes. Our lighting experts can help you simplify your lighting with modular wiring. Ask us about installing relay and distribution panels to give you more flexibility with energy management, time control, and scheduled dimming options. We offer a wide range of 120, 230, and 277-volt in-wall dimming switches in a variety of styles and colors to perfectly complement your interior design. We also provide options for dimming systems that can by controlled remotely by mobile apps, keypad, or by touchscreens. Our low-voltage systems can be used with incandescent lighting, 2-wire fluorescents, and other commercial lighting fixtures. 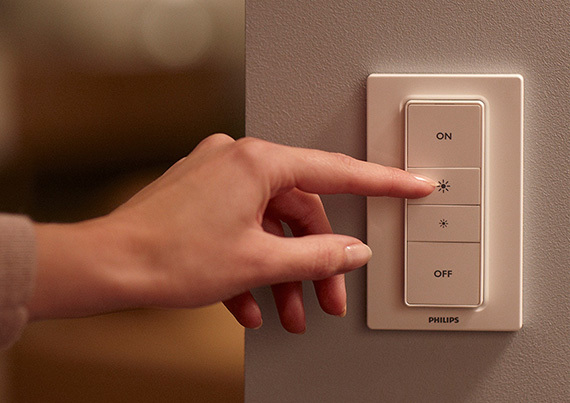 In most cases, your switches and buttons can be swapped out in minutes, allowing you to customize your dimmers and get quick repairs if needed. Trust Custom Electrical Solutions to provide you with fully customizable dimming systems!